In the previous post we have learned about Star Delta Starter. In this post we are going to learn about Direct Online Starter or DOL starter. A starter is generally used to limit the high starting currents. An induction motor has high starting currents which may cause the winding's to damage. In order to prevent this we use starters while starting an induction motor. Direct online starter is one of the simplest motor starter which is used for starting the induction motor. This starter is generally used for starting of cage type induction motors. Note: Starter action will be only at the start of induction motor i.e, until it gains a required amount of speed (generally until it reaches 85% of synchronous speed) after that it will be isolated from the circuit automatically by few internal actions. 1.We start by closing the contactor and by applying full voltage across the motor winding's. This causes the motor to draw very high amount of staring currents for a short duration. 2. Now the iron coil will get magnetized and the current will be limited to locked rotor current of the motor. Now the motor will develop locked rotor torque and accelerates to achieve full speed. 3. While it is accelerating the current will decrease slowly. Clear drop of current can be seen only after motor reaches 85% of synchronous speed. 4. Note that starting current curve depends only upon terminal voltage and design of motor, it doesn't depend upon the load applied on the motor. 5. 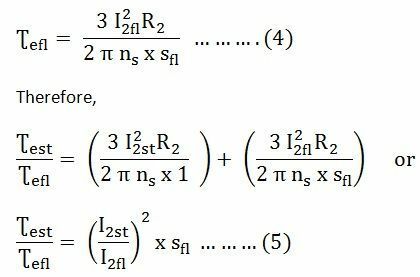 Motor load only affects the time taken for the motor to accelerate to full speed but not magnitude of starting current. 6. Only if the torque developed by the induction motor with DOL starter exceeds the load torque then only induction motor accelerates to full speed if not the induction motor must be replaced with a suitable capacity induction motor which can develop torque more than the load torque. Key point: DOL starter has maximum starting current and maximum starting torque. let us see use of these parts in detail now. The contactors that we are using are electromagnetic contactors. With the help of electromagnetic energy they can make or break the circuit. It consists of a coil wound on a iron core. So when the electrical energy passes through this coil the coil makes the iron gets magnetized as a result it attracts the armature and hence the circuit is made that means a closed circuit is formed. When the current interrupts the iron core gets demagnetized as a result it releases the armature this breaks the circuit. The contactor has three main normally open(NO) contacts and auxiliary contact which has lower power ratings and it can be of normally open(NO) or normally closed(NC) type. From the name it suggests that it is used for over load protection. Generally over load relays have inverse-trip-time characteristics. It cannot provide protection against short circuit currents it only provides protection when the high currents are drawn for a longer period. This is the main advantage of this over load relay over fuses. As we have high inrush currents at the start of motor for a short period of time if we use a fuse it melts every time when we start a motor but this shouldn't happen, moreover if we use high capacity fuse to prevent this it cannot sense the currents which can damage the motor winding's. Unlike fuse over load relay is useful in this case since it permits high currents only for short time and high inrush currents at start of motor exists only for shorter duration the over load relay doesn't trip at the start. But later on when the current drawn exceeds the full load current for a longer duration then the over load relay trips the circuit. This means over load relay senses and reacts to the harmful over load currents only. We can classify over load relays based on the characters that are used to detect the over load conditions. Based on the rising temperature caused by over load currents the thermal relay trips and breaks the circuit. This can be further classified into two types namely melting alloy and bimetallic. When the current exceeds a certain limit the coil gets magnetized which helps to trip the relay and break the circuit. It will not be affected by temperature. These are very ideal relays and can trip the circuit precisely and in fast manner. They can be installed easily. Now let us discuss the working of DOL starter or direct online starter in detail. We can understand the working of DOL starter clearly by seeing the circuit diagram of DOL starter. 1. To switch on the induction motor first press the start push button,S1. Now the contactor gets energized from two lines L1, L2 . 2. As a result three main contacts and auxiliary contact gets closed and ab is short circuited. So now the motor gets connected across the main supply. 3. Start button goes back due to spring action but the contactor gets energized through ab. 4. If the stop button is pressed supply through contactor is stopped and as a result the coil gets demagnetized and the main contacts and auxiliary contacts are opened as a result induction motor is disconnected from main supply. 5. Now to start the motor again we need to push the start push button. How Under Voltage Protection Is Done? When the voltage falls below a certain level or when there is fail in providing supply the coil of contactor gets de-energized as a result supply to induction motor stops. In this way under voltage protection is done. How Over Load Protection Is Done? When there is over load the over load coils in the circuit gets energized and the normally closed coil D will change to open position, contactor coil gets de-energized which causes the supply to induction motor to stop. In this way induction motor winding's are saved from burning or over heating due to over loads. Ist be the starting current drawn from the main supply per phase. Ifl is the full load current drawn from the main supply per phase. Ʈest is the starting torque. Sfl is the slip at full load. At start, S = 1, I2 = I2st, Ʈe = Ʈest. Ze10 is the standstill impedance per phase of the motor referred to the stator. 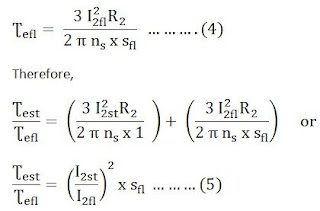 Then the current at the starting is given by the equation as shown. Starting current is equal to the short circuit current. 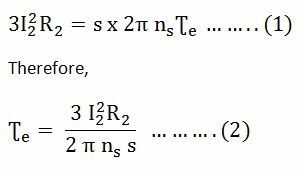 This the relation between start torque and full load torque of induction motor. 1. It is the simplest form of starter. 2. It is more economical starter. 3. It gives high starting torque. 4. Control circuit is simple and can be easily troubleshooted. 6. Easy to find fault. 2. High starting currents of motor causes the large voltage dip or drop of electrical supply which affects the other appliances connected to the supply. 3. High starting torque required by the load may cause increasing mechanical stresses on motor mechanical parts as well as the loads. 4. Not suitable for motors having higher ratings( above 10 KW). In this post we have learnt about the working of DOL starter or direct online starter. To download this post on DOL starter or direct online starter as PDF click here.